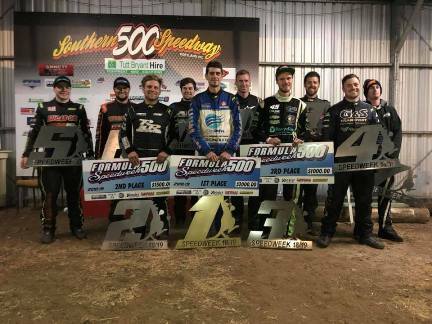 There’s no better way to ring in the New Year than by taking out the overall Formula 500 Speedweek Series spoils and sharing the podium with your brother, and that’s exactly what the Bellman brothers did over the weekend, with Dion clinching the Speedweek victory and Chris placing second. Dominant is one word to describe the brothers’ Speedweek Series campaigns, with the Bellman family collecting four of the six available round wins throughout the series, which took place over the Christmas-New Year period. A model of consistency, Dion’s victory in the series was a convincing one, with the younger of the two brothers driving to three feature-race wins, while Chris picked up one. However, it wasn’t just their overall Speedweek Series results that gave them reason to celebrate. Their campaigns were also bolstered by a 1-2 feature-race finish at Hamilton’s Western Speedway, where Chris came home in the runner-up spot behind Dion, with the result being the perfect precursor to their final standings on the Speedweek Series leader board. “I’ve won an South Australian Title before, but every round of Speedweek feels like an Australian Title, so to come away with four round wins, and first and second place overall for my brother and I is an incredible accomplishment for the team,”expressed Dion, who banked 678.5 points to cement himself in first place, while Chris avoided third place to claim second by a narrow margin of just a single point. “Racing at so many different tracks over such a short timeframe and going up against the best Formula 500 drivers in the country is very gruelling and you really need to be consistent from qualifying through to the feature race during each round. Getting Speedweek Series underway at Simpson Speedway, it was Chris who got the better of Dion in the opening round, coming home fourth ahead of Dion in eighth, and he managed to back up this performance in round two at Mount Gambier’s Borderline Speedway, this time crossing the finish line in first place, while Dion rounded out the top-five finishers. Experiencing the team’s best result at Western Speedway with their 1-2 finish, the brothers once again shared the podium at Darlington’s Mid-Western Speedway in round four, this time with Dion in first place and Chris in third. The fifth round of the series took them to Laang Speedway saw Dion greet the chequered flag in sixth and Chris in 10th, but they managed to bounce back in the sixth and final round at Portland’s Southern 500 Speedway, with Dion returning to victory lane and Chris placing just off the podium in fourth. These pleasing Speedweek Series performances came off the back of a bittersweet Victorian Title last month at Simpson Speedway, where Chris had looked likely to claim the win, having led the entire feature race before being crashed out by another on lap 23 of 25, bringing his night to a heartbreaking end.The team’s silver lining was that Dion was able to complete the podium in third. 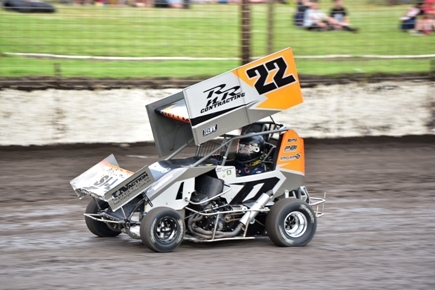 The Bellman Motorsports team would like to thank all of their 2018-19 season sponsors: RnR Contracting, Grevillia AG, Autosmart NT, InAction Photos, SI-LAC Inoculants, C.I.C Racing Wheels, PBI Australia, R&J Batteries, Sinclair Service Centre, Dirt Collective, Jettco Developments, Road and Performance Engines, and Hill Rural Contractors. Special thanks must go out to their mum and dad (Ros and Roy), their pit crew – Ash, Karli, Jesse and Michael – along with Stephen Bell, Darren Mollenoyux and Leigh Van Ginneken. To find out more about the Bellman Motorsport team, LIKE them on Facebook by searching Bellman Motorsports.